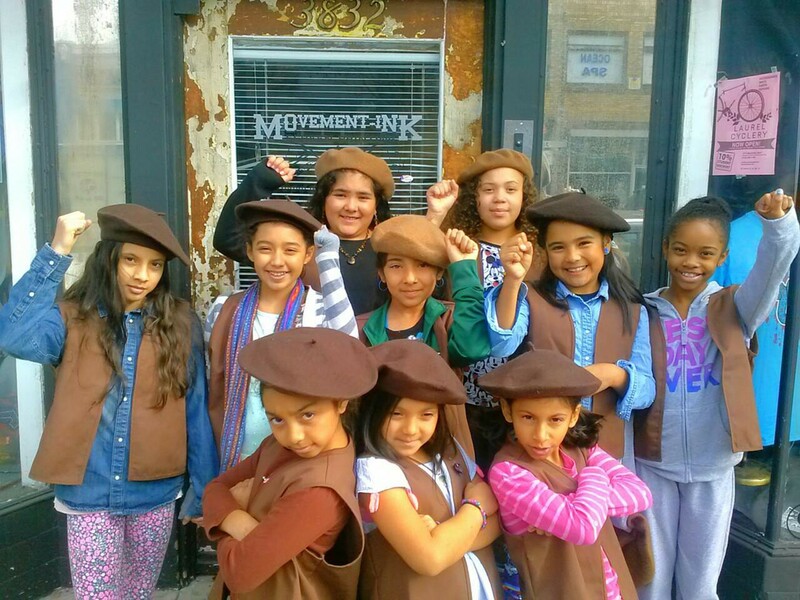 Radical Brownies troop leaders want to teach the girls to be fierce community advocates. At the Reclaim MLK Day march in Oakland last month, a troop of young girls of color sported brown vests and berets, and held signs that said "Black Lives Matter." They were members of the Radical Brownies, a social justice sisterhood for girl-identified children of color, ages eight to twelve, that hopes to nurture the next generation of leaders. Similar to Girl Scouts, participating in educational activities like the Reclaim MLK Day march earns members badges. But that system, and the vests the Brownies wear, are the only similarities between the two groups. In fact, the brown berets are much more telling of the troop's actual mission and vision. 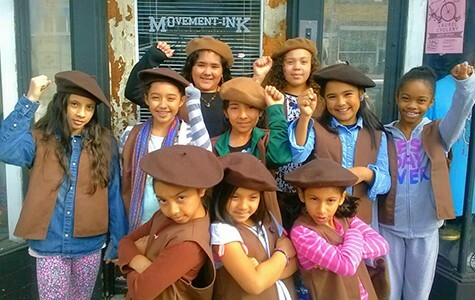 Paying homage to Oakland's legacy of social justice advocacy by groups such as the Black Panthers and the Brown Berets, the hat appropriately positions the girls as the newest addition to that ongoing movement. The idea was born when Anayvette Martinez, a community organizer in East Oakland schools, recognized that her fourth grade daughter was yearning to be part of a girls' group and gain a solid sense of sisterhood outside of school. Martinez began dreaming of what a girls' group would look like that embodied her family's radical political values. She found other great Oakland organizations for youth, but none that specifically served young girls of color with the values she envisioned. So she decided to build one. She asked educator Marilyn Holinquest, whom she met in the Ethnic Studies graduate program at San Francisco State University years ago, to co-lead the project and contribute her teaching expertise. From there, she simply asked around in her network to see if her friends' daughters would like to join. "A lot of families were like 'Oh my God, I totally have always wanted a space like this for my daughter," said Martinez. Quickly, the group grew to twelve girls before they decided to cap the admissions. In December, the troop began meeting twice a month to embark on its unit-based curriculum. The lesson plans draw from a mixture of topics that Martinez and Holinquest wish they had been introduced to as young girls of color: contemporary political issues and movements taking place in the world, and collaboration with other social justice groups in their community. Amid the many anti-racial-injustice rallies taking place in Oakland in recent months, it only made sense that one of the first units should be about the Black Lives Matter movement. Martinez and Holinquest said that broaching such a heavy topic with children can be difficult, but is absolutely necessary. They pointed out that when things are happening in the world, parents often assume that children aren't paying attention, when in fact they are. They, too, are surrounded by the media, and they listen to what adults are talking about even though they may not fully understand. "If they are not talking to you directly, or they don't have a dedicated space to talk about the issues that concern them — that they want explanation around or context for — then they have a lot of questions that go unanswered," said Holinquest, who has a young step-daughter and years of experience as a teacher. When teaching the Black Lives Matter unit, Holinquest started off with a word association exercise around topics and names like Michael Brown, to gauge what the girls already knew, then worked through and clarified their understanding, adding historical context. Next, the girls participated in three community actions in solidarity with Black Lives Matter, including the Reclaiming MLK Day march. Holinquest explained that they always make sure to follow education with action, in order to empower the girls with a sense of agency rather than hopelessness. "Often when you learn about something and how deep it goes you can feel overwhelmed," she said. "We want to maintain their hope and cultivate hope so that they can continue to do these actions to sustain change. ... We want to truly empower them so that they can contribute to the social justice legacy." At the end of this month, the girls will be receiving their Black Lives Matter badges, which Martinez and Holinquest had custom-made. For the final step, a Black Lives Matter organizer will personally present the badges to the girls, and Alicia Garza, one of the co-founders of the movement, will give a final lesson to the troop. Garza will be the first of many local female role models that Martinez and Holinquest plan to introduce to the troop. A large part of their mission is to teach the girls to be "fierce community advocates," and be unwavering in their solidarity with others who align with their values. "We really want them to understand that on a core level, in their bones," said Holinquest. The girls have also started their "Radical Beauty" unit, in which they learn about accepting their bodies despite societal pressures and norms perpetuated by the media and pop culture. The next will be "Radical Love," in which they learn about self-care and participate in activities such as assessing whether a friendship is healthy for them or not. For Valentine's Day, they will write love letters to themselves and their sisters, and discuss quotes from bell hooks and other feminists of color. Martinez noticed that even though her daughter is still young, she already feels competition from other girls and social pressures to present a certain way. If she learns how to deal with these obstacles now, she'll be emotionally solid when she's older and ready to take on the world. Although the troop is only a few months old, the initiative has been receiving an overwhelming wave of nationwide media attention, and an outpouring of community support along with it. Martinez said she had a feeling it would be popular in the Bay Area, but had no idea it would blow up to the extent that it has. Despite being flooded with requests for chapters in other cities and local requests to join, the leaders plan to spend the rest of the year focusing on developing the curriculum and the "Radical Brownies culture" with their current full troop. But they definitely intend to expand in the future. Everything they are developing is designed to scale up so that when they are ready, they will have lesson plans to share and training guides for troop leaders. They are currently reaching out to organizations for financial sponsorship, but eventually plan to become their own nonprofit. They welcome the support, but want to move slowly now to go fast later. "We have a vision of creating something really different and sustainable for us and for the community," said Martinez.